Local Inhabitants, (L-R) Nils Peterson, Erica Goss, Parthenia M.
Hicks, Dave Denny, Sally Ashton. Photo courtesy Gwen Mitchell. 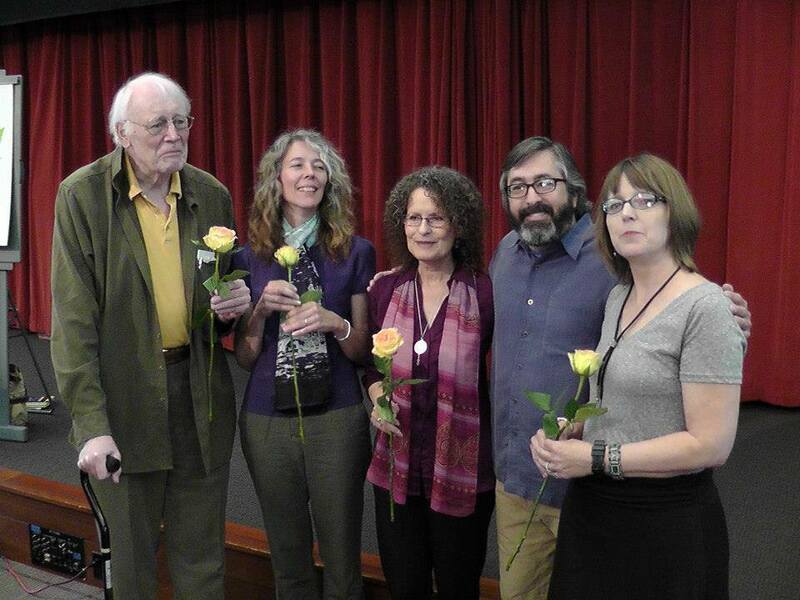 Here we are, smirky and perky after our June 15th release reading of Local Habitations, an anthology of poems of the Poets Laureate from Santa Clara County to date. As part of our release celebration, each poet laureate was asked to write a poem of exactly 100 words, title included, using the theme, “Local Habitations.” None of us knew what the others wrote. After our individual readings we came up front, drew numbers, and read our contributions in that order as one single poem. What follows is the text, as read, of our collaboration. Strange how it seems to come together as an intentional whole! In case you missed our reading, we do hope to read together again in the near future, so stay tuned. If you attended, we invite your comments below. a paler but somehow richer blue in autumn. lined along the parkway in a conspiracy of beauty. complexity we could not in spring have imagined. to gawk in silence. The tree for us is Jacaranda. that they wanted this much sun. Why not now? She thinks. Syllables pour into a hundred word universe shocked as the first hydrogen atoms. Each has a music. They circle, join, suddenly – word-sounds – “Crew went the curlew as it flew in a curlicue.” They rhyme. “Ache did,” pairs with “naked.” They gather into galaxies, “He did not know who he was until she taught him desire, then he did not know who he was,” until here, in Cupertino, at the end of the Dictionary of the Milky Way, we dangle from a participle, aware of dark matter, what has not yet been seen, so not yet said. My grandfather would have sized up this crowd with two words: local yokels. When a stranger moves to town we call him immigrant. If we move to a foreign country we call ourselves ex-pats instead. To travel from one place to another we lock our houses first. To dream, the mind throws the doors open wide. Either way we leave what we know behind. To know ourselves better we’ve unlocked the genome. We discover we’re related to everyone everywhere. We are also made of star stuff blown from the corners of the cosmos. Therefore wherever we wander, we’re home. Thanks Sally. I was hoping someone got those 500 words down. That was great stuff. Thanks for saying so, Jim. And thanks for being there. It was a great reading. Five great voices and one long and heartfelt song. We had a great time together. Thanks for your support.